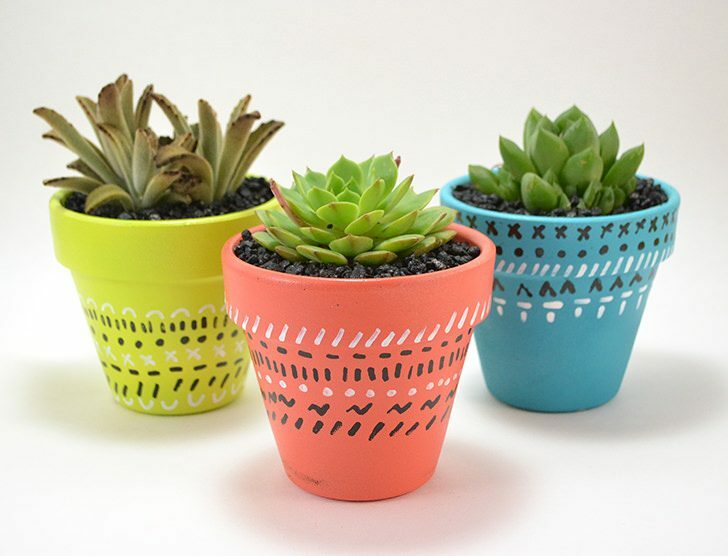 Dude I am so into succulents right now. There is such an AMAZING variety down here in my new locale and it’s fab to come home from the grocery store with a $2 succulent I didn’t even know existed before! 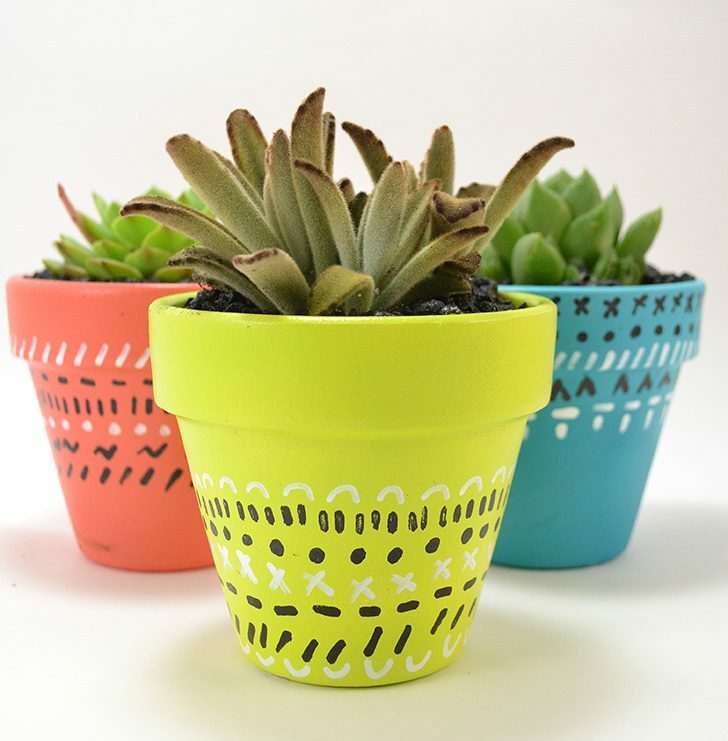 And since succulents are in, in, in, I’m so excited to be making up some crafty goodness to pop these babies in. In general I’m becoming more interested in nature and being outside. Well, I guess I’ve always loved being outside but here we have 2 different beaches to visit and great weather for bicycle riding year round. I’m spending a lot more time outside than I used to and I am loving it! So I’m down with outside but not yet down with bugs to finish that rant up… At any rate you came here for crafts, amIright? 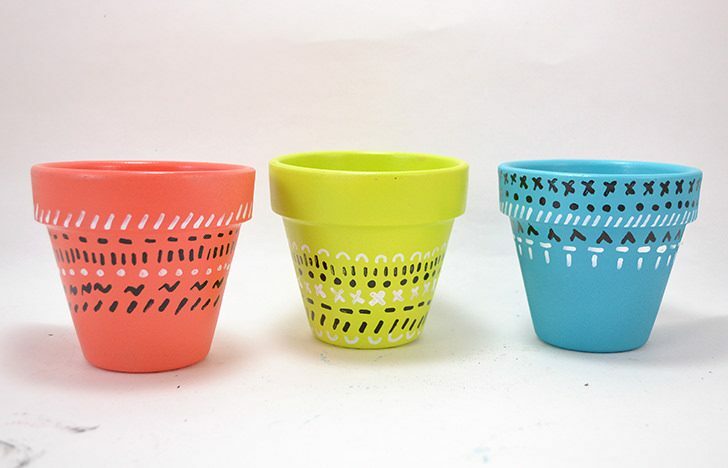 Part of why I love painting clay pots is because it is a super inexpensive project because clay pots are so CHEAP! Huzzah! 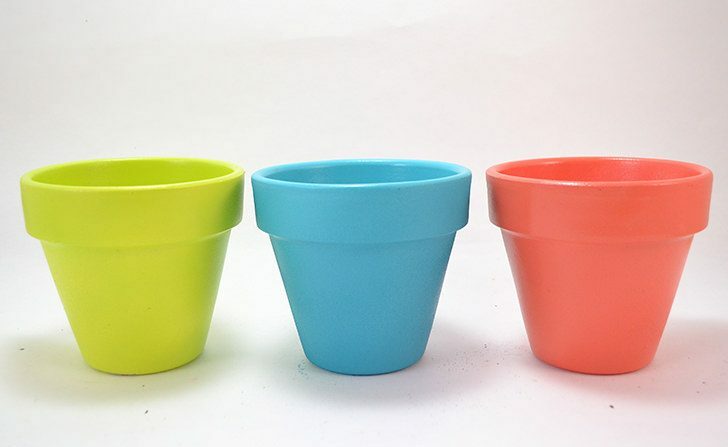 First prime and then spray your pots a solid color. Don’t go straight for the paint because terra cotta soaks that business up. Only a good coat or 2 of good quality primer is going to help you achieve solid, bright colors. 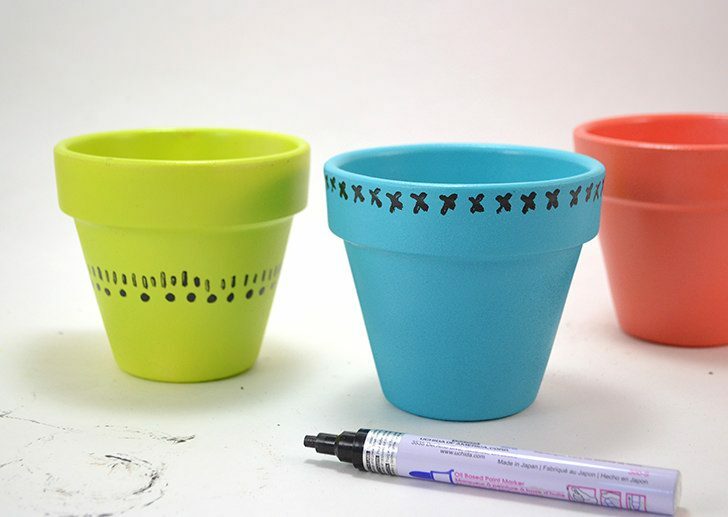 Using your markers begin drawing a simple thing like a dot, dash, or X and repeat it in a straight line across the pot. Now it doesn’t have to be perfect or perfectly straight. In fact little differences will just add to the handmade charm! 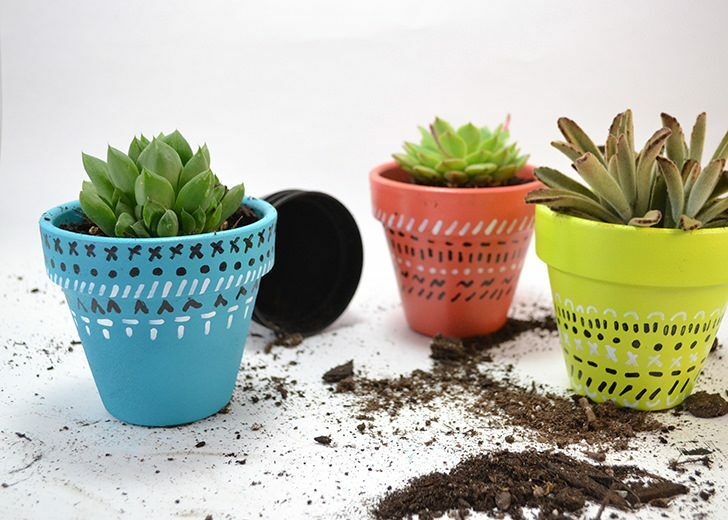 If you place your designs in different spots it’s quite charming… see? Oh, I love these so much!!! 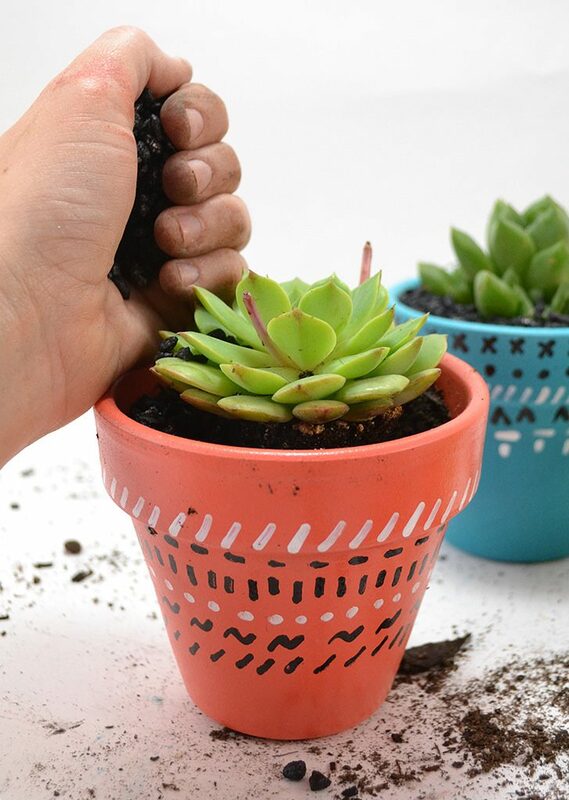 Next you’ll get your succulents planted in the pots. I always manage to make such a mess! 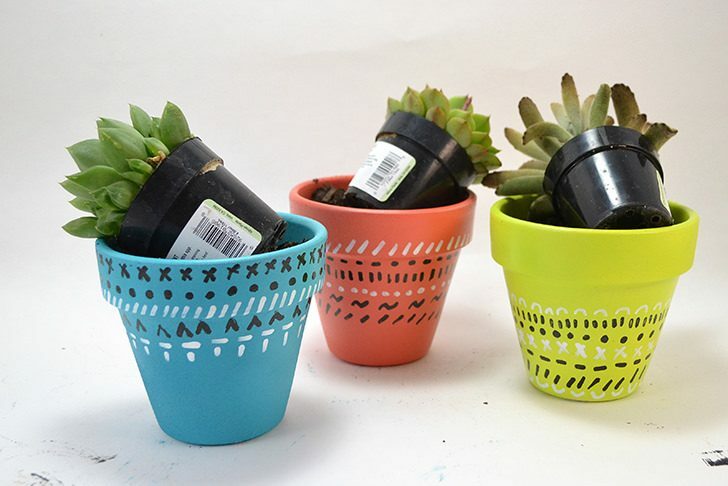 Be sure your paint is completely dry or you’ll have it stuck to your pots! 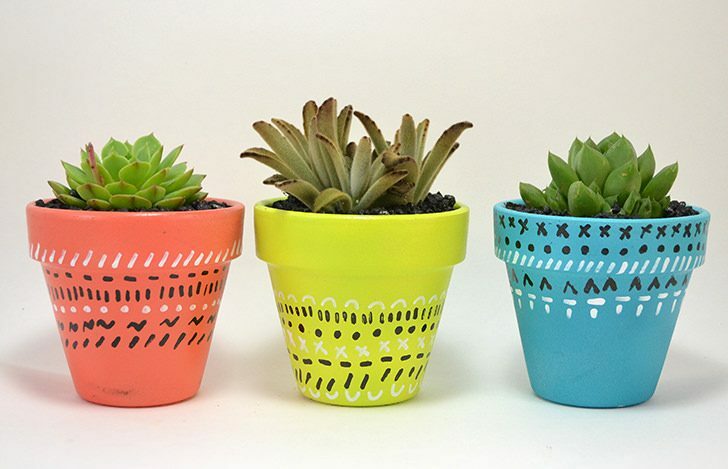 Since I already had the paints, and if you’re crafty you probably have a big stash of spray paints in your fave colors, too, this can be a super cheap project. 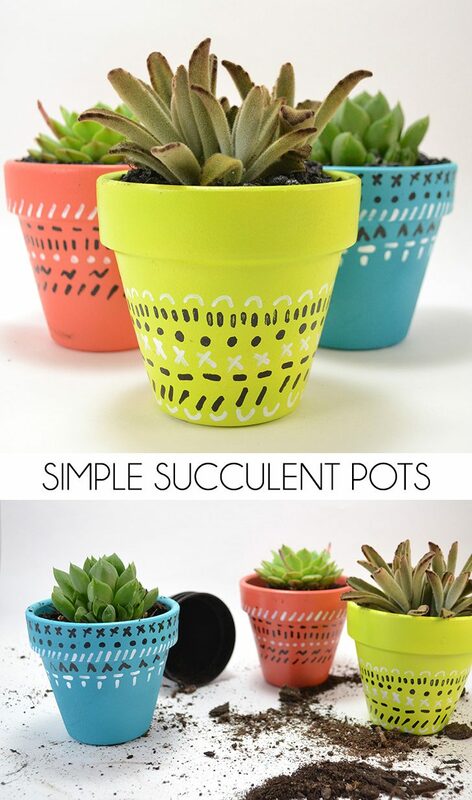 And luckily succulents are super easy to take care of (read super hard to kill, yay!) so even if you have a black thumb like me chances are you won’t waste money on plants because you’ll be able to actually keep them alive. So now I have awesome little plants in awesome little planters and more color added to my living room. 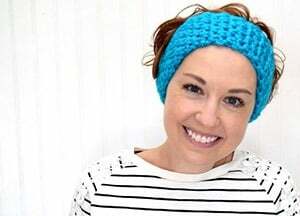 This project is a win in my book! Are all succulents tiny? All of them that I’m seeing on the web nowadays are…And before about 2 yrs ago I never heard of them. 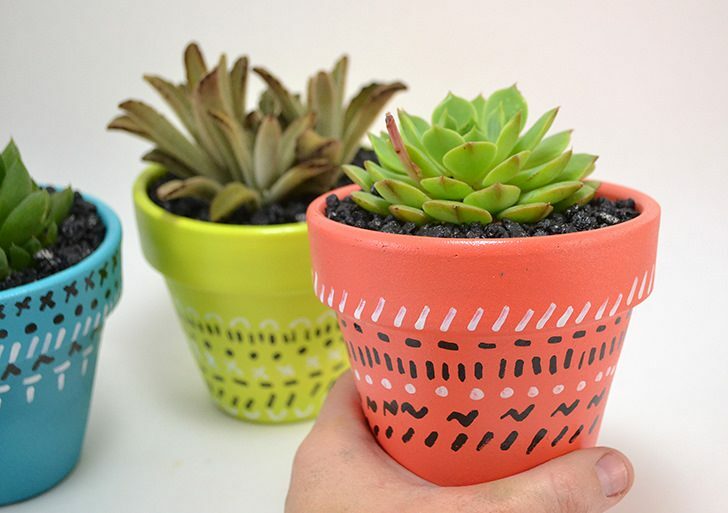 Not necessarily…I have planted some medium to larger succulents in my outdoor planters. But I live in Florida near the Gulf, so our weather, even in the so-called Winter, so they are not threatened and they grow like crazy! 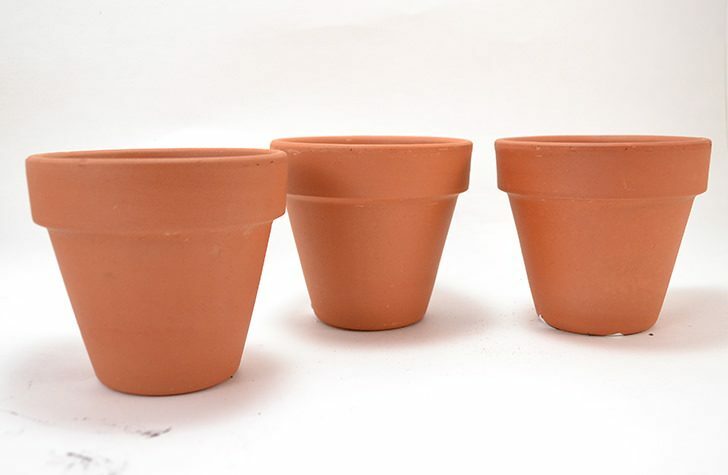 Meanwhile, if you want to plant just one plant in those pots, size up the pot diameter as well as depth and go looking for a size plant that you also have gauged its growth potential for that pot. I buy mine often at a Lowe’s or Home Depot type store!